Cartonnage - Alison Cunningham is expert at this ancient Japanese/French art, and would like to offer to show members how to make their own Cartonnage. You create beautiful box- based items from card and decorative papers. Useful for presents or household. It will be free of charge except for any essential materials ( most recycled) - please sign up on the desk- the sheet will be there from Wednesday 19th July. The first session will be in September. Photography- Eric Robinson will offer 4 Wednesday afternoon sessions, on the 12,19,26 Sept and 3 October. They will be: Introduction to camera controls; Still-life/botanical; portrait, and outdoor. Please sign up on the sheet which will be available from Wednesday 18th July onwards. Congratulations to Eric Robinson, successful portrait photographer extraordinaire, and club member. 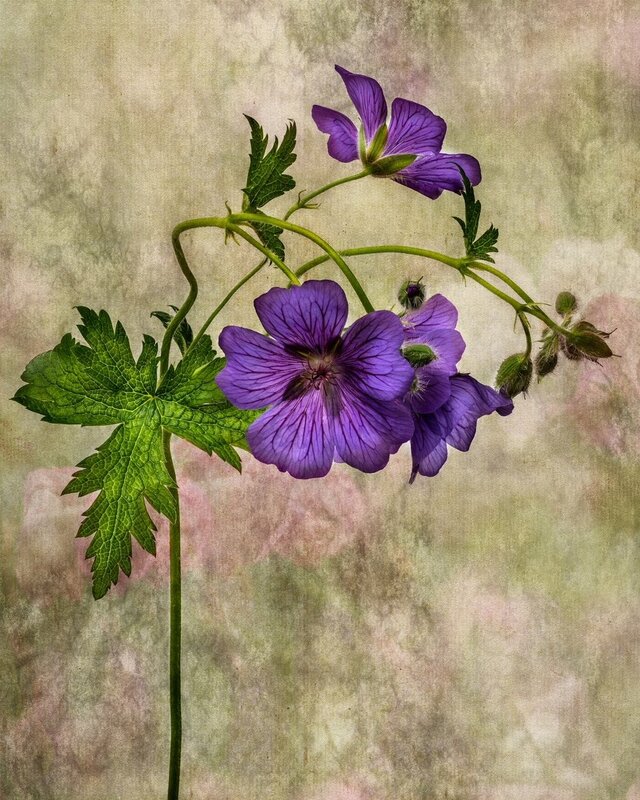 Eric truly delighted to let us know that, after working to help the botanical artists group in the Club here, he submitted his own botanical photograph for the prestigious Edinburgh Photography Society Gallery exhibition - and had great success. The exhibition is open to visitors. The graduation ceremony was very intimate. It took place in the chapel at Craiglockhart campus, the former hospital where Siegfried Sassoon met Wilfrid Owen. Their names were on the rooms and we were next to the library dedicated to the War Poets. The spirit of 1918 was all around us especially in this centenary year, and it was impossible not to think about war and its futility. Then Jim came in, and brought with him the solution to all our problems. He walked slowly but with great dignity, and he carried a smile to lighten the darkest thoughts. Love is such an overused and misused word that we dismiss it as sentimental and mawkish. In that room however was a love that was tangible. Jim’s love for everyone there, and everyone’s love for Jim. It was so powerful that it spread amongst us and made what was already a very special occasion, into an extraordinary experience. Jim has, over 40 years, welcomed more than 200,000 people into his home: people of all shapes, sizes, colours, and opinions, and no-one left unmoved or untouched by Jim’s overwhelming and unconditional love. I hesitated about using the word, until I saw the card given to me by Jim’s son Jesper. Jesper’s card gives his address as @dontbeafraidtolove and I realized that, although it is an act of bravery to love a stranger, if we dare to do it, we will find that there are more genuinely loving and loveable people in the world. Than we ever expected. Dear Jim, thank you for bringing your love to Scotland. Congratulations on your honorary doctorate and we hope to see you in Edinburgh again soon.